In these days, following the post about signatures on Iranian tombstones from XII century, I started to search similar material in museums and auction houses just to have an overall view on the subject. Well…I must admit that some of the tombstones I found are actually translated, but in other cases I found no translation available, and some confusion and misinterpretation. Here I want to try to fill the translation gap. The museum’s website provide scarce information on the tombstone. No bibliography is given, no reference works, no interpretation, no link to similar objects, not even to that kept in the museum itself (M.73.7.1). Since the date is given, I presume that someone actually has read the gravestone, but since I cannot find the translation, I will provide mine. The tombstones presents the typical design of Iranian XII century gravestone: in the centre we find a beautiful two-dimensional mihrab in which there the text containing information about the deceased. Around it there are two frames with epigraphic bands. At last, at the bottom of the mihrab image, there’s a short horizontal band, containing the signature of the carver/calligrapher. The inscriptions are carried out in a beautiful kufic script, quite plain: both the qur’anic and the historical texts do not present extensive decoration. 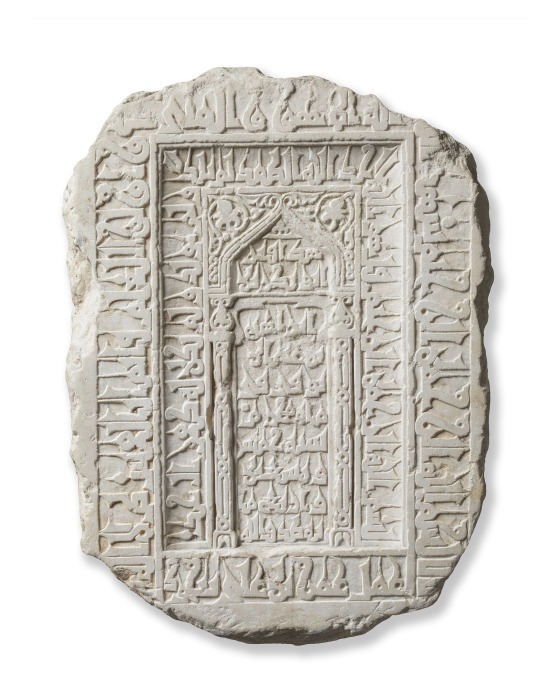 We only get that it is a marble tombstone from Iran, produced in 1101. Well, you may say it is quite enough: we know what it is, the place and the date of production. Yet I think some other information is required to explain why it has the right to stay in a museum. Anyway, in the object description provided, just under the title of the object we find a name: ‘Umar bin ‘Ali. Actually I know now that it is the name of the carver, because I was able to read the inscription. Someone not acquainted with Arabic and kufic script can also (rightly) presume it is the name of the deceased: seriously, how many times have you found a signature on a gravestone? The qur’anic texts are not translated… in fact, the museum does not even say that there are qur’anic passages inscribed. But this is (sorrowfully), pretty common. I must admit it: this tombstone is not extraordinary. Its written in kufic script, in a period in which kufic script was widely used. The design is pretty common for tombstones produced in Iran around the XII century. Also the contents are not enlightening: Q 3:18 and Q: 112 have been used always and everywhere in funerary epigraphy. The poor guy that died does not seem to have been a VIP, and it definitely seems unlikely that he can be linked to important personalities of the time. Also the carver/calligrapher, ‘Umar bin ‘Ali, does not seem to be important. This gravestone can be despised as ‘unimportant’, and I cannot blame you. But let’s take a step back and look at the bigger picture. Actually a signed gravestone is quite important in itself, furthermore it can be linked to other tombstone produced in the period with a strikingly similar design but signed by other carvers. Taking these gravestones together, linking them not only superficially, but with a deeper analysis of the designs, the styles, the signatures, maybe we will manage to better define a small part of the history of Iranian funerary art and the social environment where it flourished.